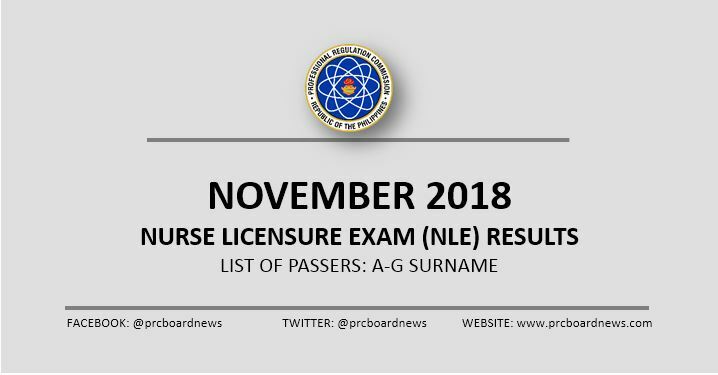 MANILA, Philippines - The Professional Regulation Commission (PRC) released results of November 2018 nursing board exam (NLE) on Friday, December 7, 2018 or in 14 working days after the last day of exam. PRC administered the NLE on Saturday and Sunday, November 17 and 18, in Manila, all regional offices nationwide (Baguio, Cagayan De Oro, Cebu, Davao, Iloilo, Legazpi, Lucena, Pagadian, Tacloban, Tuguegarao) and Zamboanga. Schedule of on-line registration for the issuance of Professional Identification Card (ID) and Certificate of Registration will be announced later.